I grew up eating beef stew mama prepared in her slow cooker, rich hunks of meat bathed in dark brown gravy, thickened with flour, and flavored with a generous slug of my grandfather’s homemade wine. She’d make a big batch and we would enjoy it for several nights, each providing a richer, fuller stew with the flavors increasingly mingled and married. She would often serve it with rice, potatoes, or buttery egg noodles. It was simple, satisfying country cooking. My immediate family is not a family of farmers, but my grandparents were from the rural South and were young married adults during the Depression. Meme always hoarded flour and sugar in her attic and they not only raised a lot of their food, they also preserved a lot of their food. People that are used to having gardens, raising farm animals, or harvesting wild game from the land are aware of the amount of work that goes into producing food, and the amount of work it takes to get food on the plate. So nothing is wasted and to that end tough cuts of meat are simmered until tender and imminently edible. 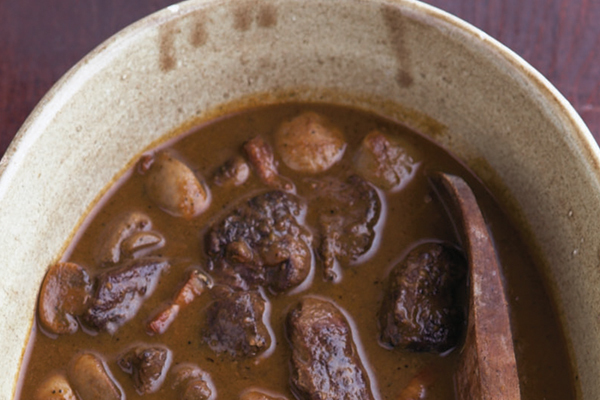 This recipe is a marriage of my mama’s slow cooker stews and a traditional country stew I learned in France. 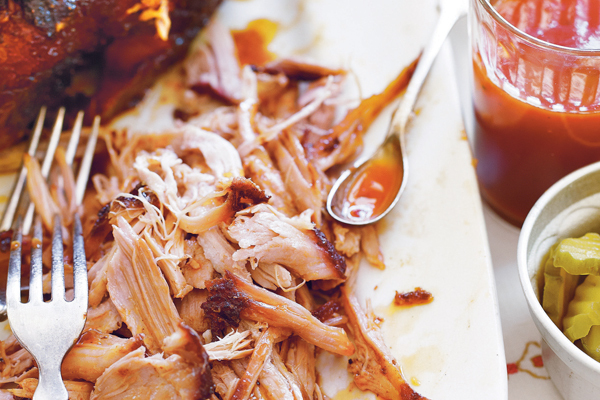 Don’t be tempted to skip browning the meat. The resulting stew will be thin and tasteless. Browning the meat makes all the difference. Serve it the day of, or as mama did, over the course of a few days. Never choose stew meat already in precut cubes. It’s more expensive and you have no idea if you’re getting, for example, leftover bits from the shoulder or rib-eye, two wildly different cuts that won’t cook at the same rate. 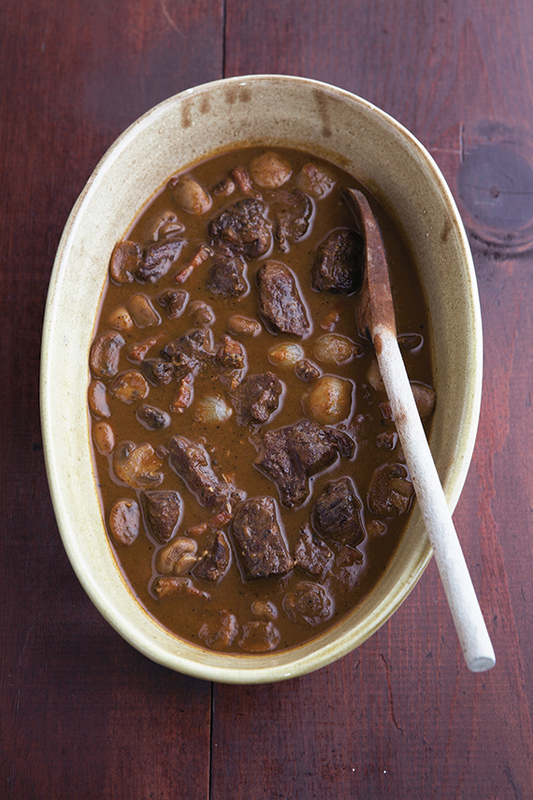 To marinate the beef, place the cubes in a large glass or stainless steel bowl. Add the wine, carrot, celery, and onion. Cover and refrigerate for at least 2 hours or overnight. Line both a baking sheet and a large plate with paper towels. Remove the beef from the marinade and transfer to the prepared baking sheet. Pat the meat dry with paper towels. Strain the marinade, reserving separately both the vegetables and the liquid. To cook the beef, heat a large skillet over medium-high heat. Add the bacon and cook until the fat is rendered and the bacon is crisp, about 5 minutes. Remove the bacon with a slotted spoon to the prepared plate to drain. Pour off all but 1 tablespoon of the bacon fat from the pan. 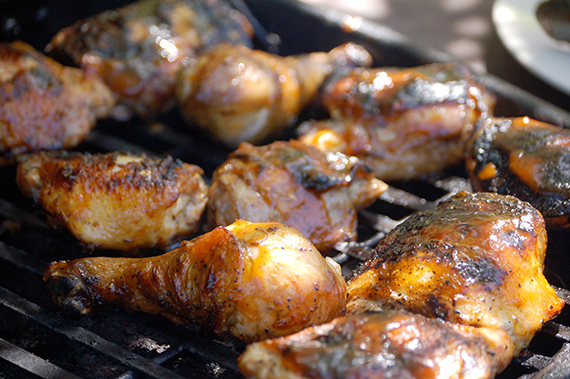 Decrease the heat to medium, add 2 tablespoons of the canola oil and heat until shimmering. Season the beef with salt and pepper. Sear the beef in two or three batches without crowding until nicely browned on all sides, about 5 minutes; transfer to the prepared baking sheet when done. (For ease of removal later, if you would like, wrap the beef cubes in a cheesecloth sack and tie with cotton butcher’s twine.) Set aside. Add the reserved vegetables from the marinade and cook until they start to color, 5 to 7 minutes. Sprinkle on the flour and toss again to lightly coat. Cook, stirring constantly, until the flour turns brown, 2 to 3 minutes. Transfer the vegetables and cheesecloth bound package of beef to the insert of a slow cooker. Add the reserved marinade liquid and enough stock to barely cover the meat. Add the bouquet garni, tomato paste, and garlic. Seal with the lid. Cook on high heat for 3 to 4 hours or low for 6 to 8 hours. Remove the bouquet garni and discard. Transfer the cheesecloth bound packet of beef or remove the individual pieces with a slotted spoon to a bowl. Remove and discard the cheesecloth. Using an immersion blender, puree the sauce and vegetables remaining in the insert until smooth. (Or, once the beef is removed, ladle the sauce and vegetables into a blender and puree until smooth a little at a time.) Return the reserved beef to the sauce. Add the mushrooms and continue to cook until tender, about 30 minutes. Add reserved bacon. Taste and adjust for seasoning with salt and pepper. Serve piping hot with noodles, potatoes, or rice. 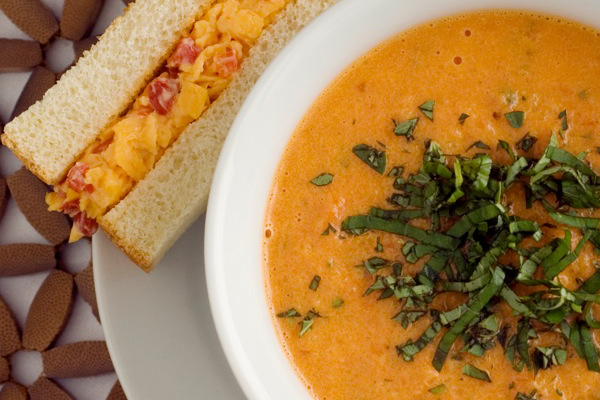 Do you have a favorite warm winter recipe? Share yours in the comments below. 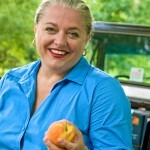 Check out Virginia’s new weekly column Down-Home Comfort on FoodNetwork.com! 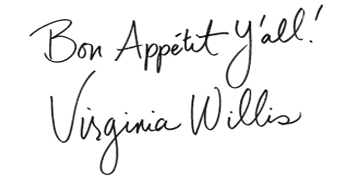 Reprinted with permission from Bon Appétit, Y’all: Recipes and Stories from Three Generations of Southern Cooking by Virginia Willis, copyright © 2008. Published by Ten Speed Press, a division of Random House.